Whenever I have the chance, I can’t resist watching any of the The Mummy movies or Indiana Jones movies (except the Crystal Skull, but that’s an issue for another time). As an archaeologist, I think I’m supposed to avoid them in some sort of protest over how the fictionalized version of my discipline is sensationalized, but I get drawn into the stories, the adventures, and, of course, the characters. I do, however, take issue with the lack of presence women have in many of the films. In Indiana Jones, the women exist as foils to the male characters–damsels in distress, of course. The one woman who was a scholar, Dr. Elsa Schneider in The Last Crusade, turned out to be a Nazi and died a horrible death. The Mummy presents women a little bit differently. The one main female character, Evelyn Carnahan, is a scholar herself, but she is clumsy, bookish, prudish, and needs the hero, Rick O’Connell, to save her life in the field. In one memorable scene from the first movie of the franchise, the other Egyptologist, Dr. Allen Chamberlain, watches as Evelyn directs her crew into a pit, and he smirks and says, “They are led by a woman. What does a woman know?” As the film goes on, it turns out that that particular woman knew quite a lot. In fairness, Schneider and Carnahan were fictional women, but as Leila McNeill and Anna Reser (and others) have pointed out earlier in Lady Science, the misrepresentation of women in film does a disservice to the way the public views their presence in science. For archaeology, these well-known fictional examples portray women who could not or should not be archaeologists, scholars, or field scientists, and therefore these representations implicitly argue that women were probably not present in archaeology at all (and if they were, they were silly). We know that this is not true. More to the point, there were a number of women archaeologists who did important work in the field, in publications, in museums, and in universities, but like much of the work women have done in the sciences, their labors are not considered Science. Their lives and careers tend to be erased in the historical record because they did not do heroic, exciting fieldwork, but instead did the seemingly hum-drum administrative work of cataloguing, organizing, and publishing the finds of the hero. In the end, many of these women got married and had families, further removing them from their career or ending it altogether, unlike their male colleagues whose marriages made them more productive. No matter their training or accomplishments, female archaeologists have been buried by Great Men. One example of this sort of burial can be found in the life and work of Caroline Ransom Williams (1872-1952). She was a student, then friend and colleague, of James Henry Breasted at the University of Chicago. In the Oriental Institute’s archives, there is a whole section with letters between the two of them. She doesn’t get her own folder or even her own box (no one does in this archive except for Breasted’s wife). But she’s there. I found her first in the Ls for Lake Erie Seminary (from where she first wrote to Breasted in 1898); then in the Rs for Ransom, Caroline; then finally in the Ws for Williams, Mrs. Grant (Caroline Ransom). They wrote to each other for 37 years, from the time of Ransom Williams’ first letter to him in 1898 until Breasted’s death in 1935. Through the decades, there are a number of issues that come through in these letters—family ties, true friendship, collegial scholarship, mutual dependence. The two share friends, interests, and expertise. They share gossip about old friends. They trade barbs about scholars they have to work with; and share advice when it comes to dealing with the difficult ones. Throughout her early career, she and Breasted became close friends, colleagues, and confidants, and it is through these letters that Ransom Williams’ life story comes to light, as well. Her professional trajectory was not unlike those of her male colleagues at the time. She came from an upper middle-class family, got a university education, went on a European Grand Tour while at university, then decided to get an advanced degree. She pursued her education as any of her male colleagues did: by applying to the leading schools in her field and writing to the heads of departments personally, looking for financial and moral support. She found support at the University of Chicago in James Breasted, who encouraged her to come to Chicago and pursue her studies. 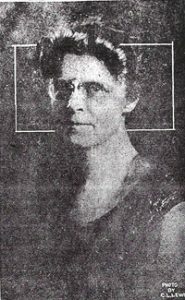 From 1898, Ransom Williams worked with Breasted and followed in his footsteps to Berlin, to work with the same scholars he did when he was a student, and came back to Chicago to complete her PhD in 1905. After her PhD, she published her dissertation, Studies in Ancient Furniture, as a book. She got a faculty position at Bryn Mawr, which she then gave up to work as the Assistant Curator in the new Egyptian Art Department at the Metropolitan Museum of Art (MMA) under Albert Lythgoe. It’s clear that Ransom Williams did everything she was supposed to do: she ticked all the boxes, she followed all the rules, she played the game the right way. She was a scholar, author, and well-respected instructor. In 1916, Dr. Caroline Ransom became Mrs. Grant Williams.When she got married, she wrote to Breasted that she refused to stop doing her work, which was mostly true. Getting married did not stop her from working, but it hindered most of her scholarly pursuits. Like many professional women in this period, she was expected to put her career on hold, if not end it, in order to take care of the home, husband, and any children the marriage may bring. They never had children, but her husband’s lucrative career in real estate along with her elderly mother’s need for care from 1905 until her death in 1933 meant that she had to figure out a way to balance her work and her home life. To do this, Ransom Williams began commuting from Toledo, Ohio to Manhattan a few times a year to work with the MMA and the New York Historical Society (NYHS). She was continually offered cataloging work, curatorial work, field work, teaching jobs, writing projects, and more, but most of them were in New York or Egypt. She turned many of the opportunities down, saying that the job should go to someone else who could do it better and more quickly. Many times, those who took on the work were men, freed from the domestic concerns that Ransom Williams had to bear. Ransom Williams kept writing and publishing, but these projects were holdovers from her earlier work at the MMA and NYHS. She wrote many book reviews and a few popular articles for the Egypt Exploration Fund (now Society), for the NYHS journal, and others. One season, Breasted brought her to Egypt with his crew (1926-27), and she was really excited about it. He asked her frequently to come to Chicago to teach, but she continually turned him down, vaguely telling him she was “not free” to do so. The truth was that Ransom Williams had challenging domestic responsibilities. Because of her domestic concerns, as well as other piecework she was trying to do, one of the projects she gave over was the translation, transcription, and publication of what would become the famous Edwin Smith Medical Papyrus. In November 1920, Ransom Williams wrote to Breasted about “the medical papyrus of the Smith collection.” She told him that there had been some issues with the management of the papers at the NYHS and that they wanted someone to work on it right away. This reasoning is a common thread that runs throughout the correspondence from her side. Ransom Williams passed the work to Breasted because he, ostensibly, had the ability and the name to do it well. It took him 10 years (the work was published in 1930), and the fine production brought him even more recognition. Breasted’s name is usually closely associated with the papyrus, and, even though he acknowledged Ransom Williams in the publication, a short mention hardly seems worthy once you understand the extent of her involvement and self sacrifice. The papyrus is one example of many I could detail where Ransom Williams gave up a career-boosting project for her family’s needs. For Ransom Williams, and for many women in the early days of academic archaeology, we can easily ask questions like: “If she had stayed in New York, would she have been the first female curator at the MMA after Lythgoe?” or “If she had accepted any of the jobs Breasted offered her at Chicago would she have been the first full-time female professor in that department?” There is always the question of married women in this period: “If she had not married, would she have been able to choose her own path and we would know her more?” Had she been a man, we would not have to ask them. Men in this period, like Breasted, had wives and children, which did not hinder their fieldwork or productivity in the discipline. In fact, many times marriage helped men’s careers. Because she was a woman, we must be careful not to pigeon-hole her career as “lost,” or as a “phenom-first” typical career. We do have to recognize that, in archaeology, the question of “what does a woman know?” is actually a foundational issue. Women knew, and did, much of the work to lay the foundations of the science, but it was men who tended to get the credit. Ransom Williams was not a groundbreaking institution founder, although she gave aid to Breasted, who was. She was not a best-selling author, although sometimes she happily prepared the materials for best-selling books, edited, proofread, and indexed them for Breasted. She was not a professor who trained a whole generation of scholars who went on to take over the discipline, but she was a colleague and assistant to men who were. The work she did was not what many would call glamorous, but it was worthwhile, discipline-building scholarship. She did the research, wrote the books, gave the talks, wrote the reviews, and went into the field. But because of her personal choices in her personal life, she was unable to make the professional leap that she had seemed poised to make in 1916. Her story, in and of itself, is an important one in the history of science. Her contributions and impact on the field were critical and the esteem to which men like Breasted and Lythgoe held her demonstrated that. But her life also fits into the large group of women professional scientists who lost and continue to lose their careers not because they don’t want to do the hard work or because they simply can’t hack it. No, women scientists leave science because of the difficulties of balancing the physical and emotional burdens of home with the burdens of work. This work largely lacks the infrastructure for understanding that scientists sometimes must be able to care for families and participate in a professional capacity. In all fairness to Ransom Williams’ colleagues, they continued to include her in their pursuits and plans, but these were too far afield for her to commit to them. Despite her hard work, she was one of many women who had followed the same path her male colleagues took, but who got buried in the dust of the archive. Caroline Ransom Williams, The Tomb of Per-Neb, with illustrations (New York: The Gilliss Press, 1915).